Dr. Larisa Likver is a board-certified physiatrist with over 20 years of medical experience, specifically pain management, both in New York City and internationally. She has been trained in Prolotherapy by the Hackett-Hemwall Foundation, the leading institution for Prolotherapy education and research. For over 35 years, the Hackett-Hemwall foundation has hosted a medical missionary trip to Honduras. Dr. Likver has advanced her expertise in Prolotherapy by participating in these missions in 2014 and 2015, dedicating her time and service to treat people who are otherwise unable to afford medical care. She is also a specialist in Neural Prolotherapy. This treatment was developed by New Zealand physician Dr. John Lyftgoft. Dr. Likver participated in some of the few global conferences in Neural Prolotherapy to obtain training from Dr. Lyftogt himself. In 2013, Dr. Likver participated in the most comprehensive global conference for Neural Prolotherapy held in Guadelajara, Mexico — further solidifying her expertise in the treatment. Additionally, Dr. Likver is recognized as a Pioneer by the American Registry for Diagnostic Medical Sonography and was one of the first to obtain Certification in Musculoskeletal Sonography in 2012. She has more than 10 years of experience implementing ultrasound guidance to dramatically improve the positive outcome of pain-alleviating procedures through directly targeted and precise injections with the help of real-time visualization. Best doctor I've ever been too! She actually listens to my problems. After just two visits with Dr. Likver, I've been pain free for over a year! I was so impressed with them that I've already been recommending them to everyone I know. The answers to many of our medical problems can be found within our own body and our natural environment. Our body has the unique and remarkable ability to heal itself when nurtured with proper medical care. A doctor’s job is to assist the natural healing process by combining the wisdom of century-old techniques with cutting-edge medical advances. At our office, we go beyond simply diagnosing a patient’s particular injury or illness and treating it. To achieve the best possible outcome for our patients we take a holistic approach with an emphasis on respect, communication and results. After identifying the patient’s needs, we create and implement an individualized plan of care that best suits the patient and yields the optimal result. If you don't see your insurance listed, don't worry! Please call or email as this list can change and we accept many insurances out of network. Dr. Likver has been a true savior. She's enabled me to live an active life again. After visiting other doctors with no results I was lucky to find Dr. Likver. I did not think that I could be cured with anything but surgery until I saw Dr. Likver. I feel like a new man. "I am very thankful to you and your amazing team, for being so thoughtful and caring towards my persona. Your treatments helped me live my life. A big thank you." "You are a gift from God and so is your staff. You are the best pain management doctor in the USA. You listen, you care and you understand." "I've been a patient of Dr. Likver's for years and find her to be thoroughly accurate, pleasant & efficient. I've recommended her to several of my friends!" "I have never had a doctor spend so much time with me discussing a course of treatment and explaining every aspect of it." "You really took the time to treat me as an individual & get to know me. If it wasn’t for you & your excellent staff I know I wouldn't be able to work through my pains." "Since coming to Dr. Likver my quality of life has improved tremendously. I am once again able to enjoy my life. Thank you Dr. Likver for giving me back my life." "She effects a miraculous cure and brings the dying back to life. Both with benevolent mind and art presented respectfully by Centerian." "This doctor really knows her stuff, and is very dedicated and enthusiastic to healing her patients." 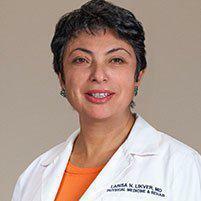 "Dr. Likver is a physician I trust and admire. Her commitment to continuing education regarding research and new approaches is inspiring. Thank you Dr. Likver!" "The most important thing is her manner. Her interest in you as a person and your life is genuine and I am so grateful. All in all high marks all around."